So on the weekend we got adventurous. We decided-on a whim, like you would- that we would make a new coffee table. Yep. We have been discussing needing a new one for a while now but we got up the gumption to take on a little DIY project. One word: pallets. Yep. It was a pinterest-inspired project naturally. We are in the staining process here. Also, that's obviously the underside of the top pallet. 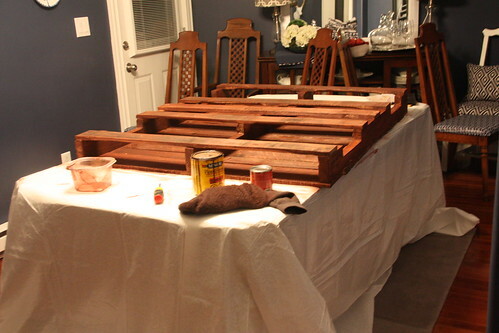 And yes, I'm staining it in my dining room. I'm hoping to share the finished product on Saturday! looks like a cool diy project! ive never stained anything before! Oh, I bet it will be pretty when it is all done. We have the materials to make a TV stand but it hasn't gotten off the ground yet.